51. What Is Blue Prism’s Robotic Automation? Robotic Automation refers to process Automation’s where computer software drives existing enterprise application software in the same way that a user does. Automation is a tool or platform that operates other application software through the existing application user interface. 52. Is it possible to click a button using the Click Image Activity if it’s not visible to the human eye? No, this is only possible with Selectors. 53. How can you get a value from an application, if it changes for each transaction? This could be done by finding a static element and then use Scrape Relative functionality to extract the value. 54. 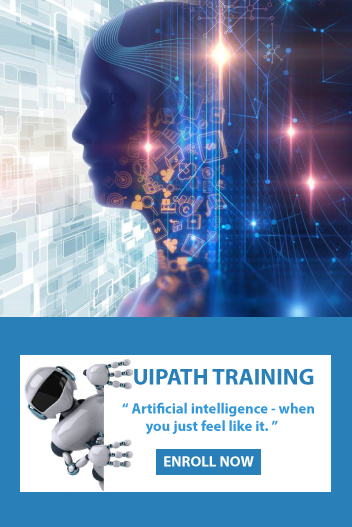 How do you invoke a UiPath workflow? Workflows are small pieces of common automation that are reusable and applicable in multiple scenarios. They are used to automate similar processes. You can invoke a workflow using “Invoke Workflow” function in UiPath and save it as a template. You can also combine two workflows to make it combined automation. 55. What does the Accuracy property represent in the Click image activity? It is a unit of measurement from O to 1 which expresses the minimum similarity between the image you are searching for and the one to be found. 56. How do you deploy the UiPath tool? Install UiPath Studio on the system you want to automate processes. 57. In UiPath studio, how elements are recognized on screen? They can be recognized through the attributes of UI elements. 58. Describe the Lifecycle of RPA? Deployment & Maintenance – Bot is deployed and maintained by the team. 59. What does Publishing mean in UiPath Automation Studio? 60. List the different types of tools in RPA?